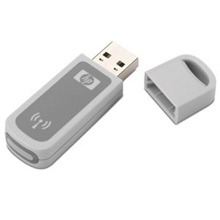 HP BT450 Bluetooth Wireless Printer and PC Adapter. Want to print color snapshots from your camera phone, laptop, PDA, or other handheld device at weddings, parties, sport events, and reunions, and on vacation? This adapter is the key. It lets you print from select Bluetooth wireless-enabled devices to a compatible HP photo printer. Downloads HP bt450 Bluetooth Wireless Printer Adapter, This download provides the basic software/drivers to use your HP bt450 with the Window's XP/Vista. This download does not include Windows XP/Vista printer software/drivers. Printer specific drivers are included in the Window's XP/Vista Operating System. The following HP printers are compatible with this software when using your HP bt450 as Bluetooth Adapter for your PC while printing to a 2nd HP bt450 with your HP printer. HP Photosmart Series 325, C7180, C6180, C7280, D5069, D5160, D7260, D7360, D7460, A430, A510, A618, A700, A826, A626 and the HP Officejet Series 470, 6310.